Reviewer Location: Alliance, NE - Date of Arrival: April 20, 2016 - Review#: 14570968 "Homecoming!" (Family trip - son returning from service) - Review Rating: 5 out of 5 stars - Review: "The house was so cute and clean! It was perfect for what we needed. The outdoor space is well kept and very private. And just a short walk to the beach and great eating establishments! We will definitely be back as soon as possible!" Reviewer Location: Englewood, CO - Guest: James S. - Date of Arrival: July 2, 2016 - Review #: 15245061 - Review Rating: 5 Out of 5 Stars - Review: "I can't say enough good things about this house! If you have done any house renting, you come to expect that each house will have a few quirks...this house has almost none! The views were absolutely great-saw my first 'green flash". The layout is fantastic with the bedrooms on one end of the house and the living areas on the other end. The pool and hot tub were wonderful-well maintained and with lots of seating around them. The kitchen was great for large groups. The only thing I noticed was additional silverware would be helpful. The bedrooms were all comfortable and most were very spacious. It was great to have so many bathrooms! The management company was the best, getting me all the information needed for check in and check out, lists of activities in the area, and quick response to the couple of times I needed assistance. Great, great house!" This is an awesome property for a family or several families depending on the number of children. There was a great backyard, a great kitchen and dining area, and it was easily accessible to most parts of San Diego that we wanted to day-trip to. All in all we were very happy and would rent here again! The garage doors opening from the dining room to the backyard created a wonderful indoor/outdoor living space, we loved it. - Jaime B.
Reviewer Location: Shoreview, MN - Date of Arrival: March 20, 2016 - Review#: 14377469 "Excellent San Diego Getaway Spot!" - Review Rating: 5 out of 5 stars - Review: "Our family of four spent 3 days/nights in this beautiful home. It was large and fully furnished with great electronics (my kids loved the music wired through the home) and all the comforts of home including a Keurig. The garage parking was awesome and super convenient as parking anywhere in SD can be tricky. It was a bit further from the beach (a good 10 min walk) than we would have liked but completely manageable and didn't stop us from doing anything. The grill, hot tub and all other amenities were excellent. Our only complaint was that we didn't book this home for more than 3 days. That was our mistake!" "Relaxation" We traveled with a group of 14, 6 children and 8 adults. The home was perfect for our group. The yard was totally fenced in which was great for the kids. The Bluewater staff went far beyond normal customer service. They were always helpful and courteous. We asked quite a bit from them and they deliverd with a smile every time. I will definately call them again when I need a San Diego vacation spot. The prices were great and they were TREMENDOUS at really looking to be sure we had the house that was best for what we really wanted for our reception. We were ready to take the first vacation rental we saw one we saw, but we were encouraged to take a look at a few more to really be sure we made the best decision. I spent a month looking on my own and stressing about not finding anything, so I am also recommending Bluewater to a friend so they don't have to go through the same stress I did. Review #7286583 Perfect Mission Beach Rental This rental exceeded our expectations in comfort and function. BlueWater Vacation Rentals went out of their way to make sure we were comfortable, and even purchased a frying pan for us during our stay. My family of 3 traveled with our best friends who are also a family of 3. Our daughters are 3 and 5 years old, and we loved this home. The staircase was the only risk, and required a good long conversation about danger. The very short walk to the beach was great. We really enjoyed sitting out side, grilling, watching a couple of movies on the large TV, and walking to the nearby coffee shop in the morning. We had family visit us at the house, and it was something to be proud of! The two parking stalls are quite tricky, yet convenient! "R & R at the Sandpiper~~~awesome!" We had a wonderful, comfortable relaxing time at the Sandpiper and definitely I will let our family and friends know of Bluewater Vacation Home Rentals. Next time I won't bring as much from home as it was fully equipped with all necessities. A most enjoyed experience and I can't wait to plan my next vacation at the Sandpiper! Review #7373406 OUR STAY WAS LIKE HOME.,CLEAN,QUIT WITH ALL CONVENIENCE TO MANY ATTRACTIONS, SUGGEST A CAR. I WOULD NOT HESITATE TO RECCOMEND THIS WELL KEPT PROPERTY. THE CUSTOMER SERVICE WAS GREAT, AND AVAILABLE FOR MORE INFORMATION REQUIRED DURING OUR STAY. Guest: M (St Cloud, MN) Date of Stay: 08/09/11 Review Submitted: 08/21/11 We really enjoyed our stay at your home. We have five children between the ages of 9 and 17 and the house was set up perfectly for the seven of us. The location was very convenient for our daily excursions and only a mile from the La Jolla cove and village. The house was impeccable and very comfortable. We appreciated the use of your beach towels, beach chairs and sand toys. Also enjoyed the beautiful views from your deck. We will definitely recommend your home to others! Review #6332870 Perfect Oceanfront Experience - Couldn't ask for a better experience! 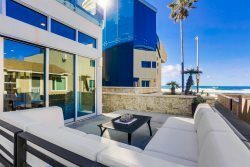 Luxury Ocean Front La Jolla is as described -- luxury and oceanfront. The three-level home perfectly accommodated our group -- two adults and six teenagers (call us crazy!) The two teen girls took the bottom level, the four teen boys had the middle section, and we enjoyed the spectacular master suite with panoramic ocean views. The kitchen was fantastic, and the outdoor eating areas suited our needs. The BlueWater concierge referred us to RADD Sports, which delivered six bikes and six boogie boards to the home on our arrival. The teens spent the week biking into La Jolla Village and also along the dozens of miles of bike paths in Pacific Beach and Mission Beach -- while we enjoyed wine and reading on the decks of the home, with phenomenal sunsets. The beach looks rocky from photos but is a beautiful sandy beach in many sections. Much cleaner and more private than La Jolla Shores beach. The teens thoroughly enjoyed the surf right out front, as well as paddle boarding and tubing on Mission Bay, and SeaWorld's Aquatica Water Park in Chula Vista. Everyone in our group rated it the vacation of a lifetime!